This application note investigates “how to effectively eliminate over-stress of MOSFET during start-up of flyback converters” in three major aspects: first, the design of flyback controllers with the Richtek proprietary embedded soft-start function; next, the relationship between feedback stability of the system and stress of switching MOSFETs; finally, analysis and design of a passive voltage clamp RCD Snubber. When developing power supply systems, R&D engineers can refer to this note on how to reduce stress of switching MOSFETs to prevent them from being damaged, and also to enhance reliability of circuit operation. Figure 1 is a circuit diagram of a typical flyback converter. Richtek RT7736 – SmartJitter PWM flyback controller is taken as an example. The functional block diagram, from the RT7736 datasheet, is shown in Figure 2. When VDD goes up and exceeds the threshold voltage (VTH_ON) of the controller IC RT7736, the controller will start to operate and Soft Start (SS) function will be activated immediately. The oscillator, built in the controller IC, generates a clock to set the S pin of an S-R Flip-Flop. The voltage (VCS) across the current sense resistor (RCS) will compare with the lower value between the feedback voltage (VCOMP) and the current limit signal (VCS_CL) from Constant Power block. If VCS exceeds the lower value between them, the PWM comparator output will reset the S-R Flip-Flop and then the pulse width of VGATE is thus determined. A flyback controller IC controls the switching transistor (Ex: MOSFET) of a flyback converter via the GATE pin. When the switching MOSFET turns ON or closes, the input voltage is completely across the transformer (coupled inductors) so the inductor current increases linearly and thus the energy stored in the inductor gradually increases. On the other hand, since the power diode is reverse-biased at this stage, it is the output capacitor that supplies the energy to the output load. With the feedback control signals, the gate drive signal (VGATE) can be set to turn off the switching MOSFET. Once the MOSFET is switched OFF, due to the continuity of the magnetic flux of an inductor, the power diode is forced ON, and the inductor voltage will inversely induce the magnetic flux. The inductor current now flows through the diode, and decreases linearly. This current will supply the output load and also charge the output capacitor until the next cycle is triggered by the internal clock of the controller IC. The switching operation of a flyback converter will be repeated every clock cycle in such pattern. Figure 3 illustrates how a flyback converter and its controller operate in continuous conduction mode (CCM). where VIN is the input voltage across the transformer; LP is the primary-side magnetizing inductance of the transformer; VO is output voltage; VF is the forward voltage of the power diode; n is the turns ratio of the transformer; NP is the primary-side number of coil turns of the transformer; NS is the secondary-side number of coil turns of the transformer. When a flyback converter just starts up, the output voltage is still zero, and has not been built up yet. From equation (2), it can be seen that the falling slope of the current sense resistor voltage (VCS) is close to zero, too. Since the controller IC will turn on the switching MOSFET for at least a minimum ON time (TON_MIN), VCS will keep rising. Henceforth, peak current of the MOSFET will continue to increase with every cycle. The moment the MOSFET is switched OFF, the accumulated peak current, the leakage inductor of the transformer, and the parasitic capacitor of the MOSFET can cause a high frequency oscillation, which then induce a huge voltage spike across drain and source (VDS) of the MOSFET. Therefore, during start-up of a flyback converter, under high line input voltage condition, the over-stress problem of the switching MOSFET will arise, as shown in Figure 4(a). Besides, when the output of a flyback converter is short and then auto recovery protection will be triggered by the controller IC, the stress of the MOSFET will become even worse under high line input voltage condition, as shown in Figure 4(b). The Richtek proprietary embedded soft start function, incorporated in the RT7736 – SmartJitter PWM flyback controller, can effectively suppress peak current during start-up to enhance reliability of circuit operation, and also allow the lower rated voltage and current for switching power MOSFET. The proprietary embedded soft start function will be activated first when the controller IC starts to operate. With the features of a stepped current limit signal as well as overcurrent threshold voltage (VCS_SKP) and cycle skipping mode, step by step, output voltage can be slowly built up. During soft start, when the voltage on the current sense resistor (VCS) exceeds overcurrent threshold voltage (VCS_SKP), the controller IC will enter cycle skipping mode. Since the cycle is skipped, this allows more time for the inductor voltage to induce inverse magnetic flux. Thus, peak current of the switching MOSFET can be reduced, and the pulse width of the gate voltage (VGATE) for the next cycle can be wider than Minimum On Time (TON_MIN) so that the output voltage can be built up more efficiently. Figure 5 illustrates how the Richtek proprietary embedded soft start function works. Figure 6 shows the comparison between conventional soft start and the Richtek proprietary embedded soft start function -- cycle skipping mode. The same flyback converter power supply system is used for experiments, which are to measure the stress during start-up of the system. Figure 7 shows the comparison between conventional soft start function and the Richtek proprietary soft start function on the same flyback converter after power on. A high voltage spike is seen on the system with a conventional soft start function right after power on. When the output voltage is gradually established, such that the magnetizing flux of the inductor and the inverse magnetic flux induced by the inductor voltage will be close, the stress of the switching MOSFET is reduced gradually. When eventually the output voltage is completely built up, the maximum voltage stress (VDS_MAX) of the switching MOSFET will also be reached. The same flyback converter power supply system is used for experiments, which are to measure the stress when the output of the system is short. Figure 8 shows the comparison between conventional soft start function and RICHTEK proprietary soft start function on the same flyback converter during output short. When the output of a flyback converter is short and then auto recovery protection will be triggered by the controller IC, the stress of the MOSFET will become even worse under high line input voltage condition. The optimized Richtek proprietary soft start function with output short protection can effectively reduce stress of switching MOSFETs so that they can be prevented from damage to enhance reliability of circuit operation. In the design of flyback converters, the turns ratio (n) of the transformer is directly related to voltage stress of MOSFETs. In other words, the maximum duty cycle determines the turns ratio of the transformer, which then decides voltage stress of MOSFET. where Vin_max is the maximum input voltage across the transformer; n is the turns ratio of the transformer; VO is the output voltage; VF is the forward voltage of the power diode; VSpike is voltage spike caused by the leakage inductance of the transformer (will be explained later). According to the operating principle of converters, the duty cycle can be seen as the ON-Time ratio of switching MOSFET and Diode. From the viewpoint of effective semiconductor utilization, the condition that either one has half duty cycle can achieve the highest utilization rate. In other words, the maximum duty cycle (Dmax) is set at around 0.5 to have the highest utilization rate for MOSFET and Diode. Therefore, Duty Cycle is normally set at 0.5 at the lowest input voltage. Then calculate the turns ratio (n) of the transformer and adjust n and Dmax, based on voltage stress margins of MOSFET and Diode. 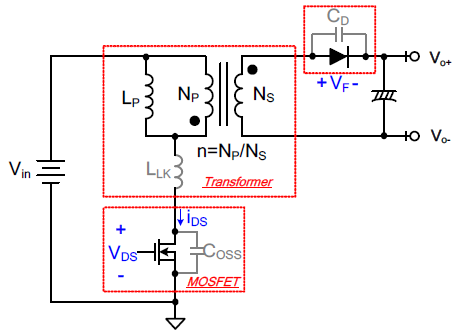 For details about how to determine turns ratios of transformers in flyback converters, please refer to the application note of “Design Guide for Fixed-Frequency Flyback Converter.” However, “Flyback Converter – the Relationship between Feedback Stability and Stress of MOSFET”, which is often neglected by designers, will be discussed in this application note, while assuming the flyback converter and the turns ratio of its transformer have been optimized. To investigate feedback stability of the flyback converter, the existing RHP zero of the flyback converter must be first understood. This zero cannot be compensated with the conventional pole, so the cross-over frequency (fc) must be set far below this RHP zero. Practically, the cross-over frequency is usually set below 3kHz. For an off-line flyback converter, it is most appropriate to set cross-over frequency in the range of 800Hz to 3kHz, and phase margin (ψm) > 45° under the condition of low line and full load, given 65kHz as the switching frequency. Please refer to the application note of “Feedback Control Design of Off-line Flyback Converter” for the details about feedback design of flyback converters. With different compensation designs for feedback stability, the same flyback converter power supply system is used for experiments to measure stress of MOSFET and to prove the theoretical analysis. Two feedback compensation designs, fc < 800 Hz & ψm < 45° vs. fc > 800 Hz & ψm > 45°, are examined for the relationship between feedback stability and stress of the MOSFET. 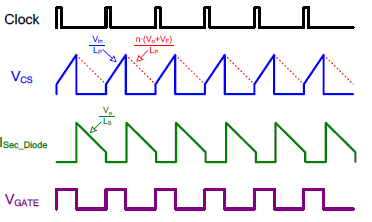 Figure 9 and 10 show the measurements of cross-over frequency and phase margin of the loop gain under the conditions of low line and high line, respectively, both with full load. Referring to Figure 11 for stress of MOSFET of the flyback converter under the condition of high line and full load, it can be seen that with lower cross-over frequency and insufficient phase margin, the transient response is slower, which causes the overshoot when output voltage is built-up. From equation (4), it can be seen that the overshoot of the output voltage will increase stress of the switching MOSFET. Therefore, with careful design of cross-over frequency and phase margin to achieve better feedback stability compensation, stress of the MOSFET of a flyback converter during start-up can be effectively reduced, which can thus prevent MOSFET from damage. Since the leakage inductor of a transformer and the parasitic capacitor of a MOSFET of a Flyback converter exist, Figure 12 depicts the equivalent circuit model of a flyback converter as well as these elements. When the MOSFET turns OFF or opens, because the magnetic flux of an inductor must be continuous and the magnetic flux stored in the leakage inductor cannot be transferred to the secondary side, the leakage inductor current is cut off immediately, which causes a high voltage spike across the drain and source of the MOSFET (VDS). The resonance caused by the leakage inductor of the transformer and the parasitic capacitor of the MOSFET triggers high-frequency oscillation, as shown in Figure 13. Figure 13(a) shows a flyback converter operates in continuous conduction mode (CCM), and Figure 13(b) in discontinuous conduction mode (DCM). where iDS_Peak is the peak current through the MOSFET, from the primary side of the transformer; LLK is the primary-side equivalent leakage inductor of the transformer; CP is the primary-side equivalent parasitic capacitance of the transformer; COSS is the MOSFET parasitic output capacitance; Vin is the input voltage across the transformer; n is the turns ratio of the transformer; VO is the output voltage; VF is the forward voltage of the power diode. The voltage spike, caused by the parasitic inductor and capacitor of the components, and the resulting high-frequency oscillation will cause great stress and even damage to the switching MOSFET. High-frequency oscillation may also induce EMI noises to the power supply system and result in reliability problem for the circuits. An appropriate Snubber can be added to suppress this high-frequency oscillation so that the problems mentioned above can be effectively resolved. A passive voltage clamp RCD Snubber, which is now widely adopted in flyback converters, is introduced in this application note and is depicted in Figure 14. The moment when the switching MOSFET turns OFF, the magnetic flux of the inductor must be continuous, so the leakage inductor current of the transformer continues to flow in the original direction. However, this current will flow into two paths; one path (iDS) is through the gradually switching-off MOSFET and the other (iSn) is through the diode of the Snubber to charge the capacitor (CSn). Since the voltage on CSn cannot change abruptly, the rising rate of the MOSFET voltage is then reduced. Besides, the original switching-off power dissipation of the MOSFET now gets to transfer to the Snubber. Figure 15 shows the voltage and current waveforms of a passive voltage clamp RCD Snubber, operating in discontinuous conduction mode (DCM). where iSn is the current through the diode of the Snubber. where Pin is the input power of a flyback converter. where the capacitor voltage (VSn) is usually set as 2~2.5 times of n×(VO + VF). The maximum drain-source voltage (VDS) of the switching MOSFET in a flyback converter usually occurs when the system operates at the highest input voltage and full load condition. Therefore, it can be used as a design condition to find the capacitor and resistor values in the design of the passive voltage clamp RCD Snubber for a flyback converter. As for the diode in the Snubber, a fast diode is the typical choice. Figure 16 shows the comparison of the stress on the switching MOSFET of the same flyback converter power supply system, with and without a passive voltage clamp RCD Snubber. An optimized passive voltage clamp RCD Snubber can effectively reduce stress of MOSFET to prevent damage and to enhance reliability of circuit operation, and also to improve the EMI problem induced by high-frequency oscillation. 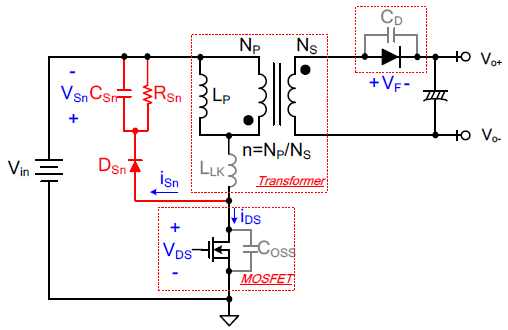 Power MOSFETs, switching components, play an important role in switching power converters. Flyback converters have the features of isolation between primary and secondary sides, simple circuit architecture, few components, and low cost, etc. so that they are widely used. The maximum stress of the MOSFET in a flyback converter does not necessarily occur when operating at steady state with full load. Instead, start-up time of a flyback converter is what to be carefully examined. 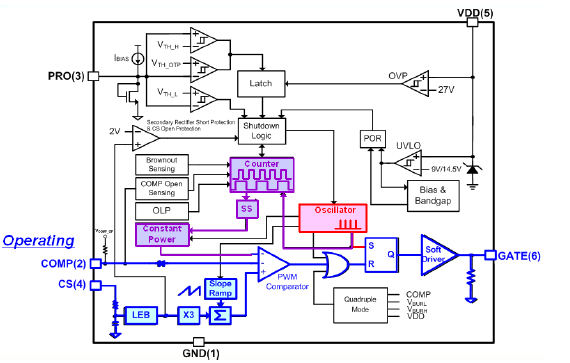 This application note provides the theoretical explanation, verified by the experiment results, and investigates “how to effectively eliminate over-stress of MOSFET during start-up of flyback converter” comprehensively in many different aspects: they are from the core of the system – the soft start function of a flyback controller IC, the system level – feedback stability compensation of a power system, finally to the added application circuit – analysis and design of a passive voltage clamp RCD Snubber. It aims to provide R & D engineers with a good reference on how to reduce stress of the MOSFET to prevent damage and to enhance reliability of circuit operation in the development and design of a flyback converter power supply system.